Skimz has launched a new space-saving Skimz Piramid protein skimmer for people want a smaller protein skimmer without sacrificing power by slimming down the width by up to 36% over previous designs. 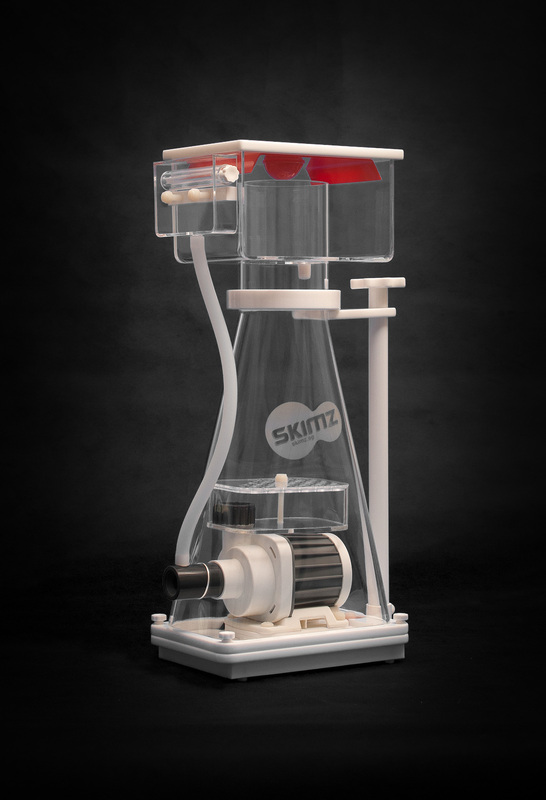 Powering the new Skimz Piramid is the new R14 TinyAir bubble plate with a ratio of 4-to-1 of fine holes to coarse holes to increase production of fine bubbles to increase efficiency. As the company notes the smaller the bubble, the greater will be the surface area for attraction of the organic waste. Smaller bubbles have advantages, they rise slower for a longer dwell time and with the same volume of air, smaller bubbles increase surface area to help attract organic waste. Besides the cone shape and R14 TinyAir bubble place, the new Skimz Piramid sports a semi-pipeless design and a micro-adjustable valve. Powering the skimmer is a DC pinwheel motor that has six preset settings and a feeding mode shutoff timer. The new Skimz Piramid comes in five different sized models the SP163, SP183, SP203, SP253 and SP283.